They sure knew how to package Jell-O a hundred years ago. The “Safety Bag” would keep it “as pure and sweet” as the day it was made for years. I checked the “best used by” date on a package of Jell-O in my cupboard. The date was November 16, 2014. Time flies, and I don’t remember when I bought it, but I don’t think that it was real long ago. In any case, I discarded the package . . . sigh . . . 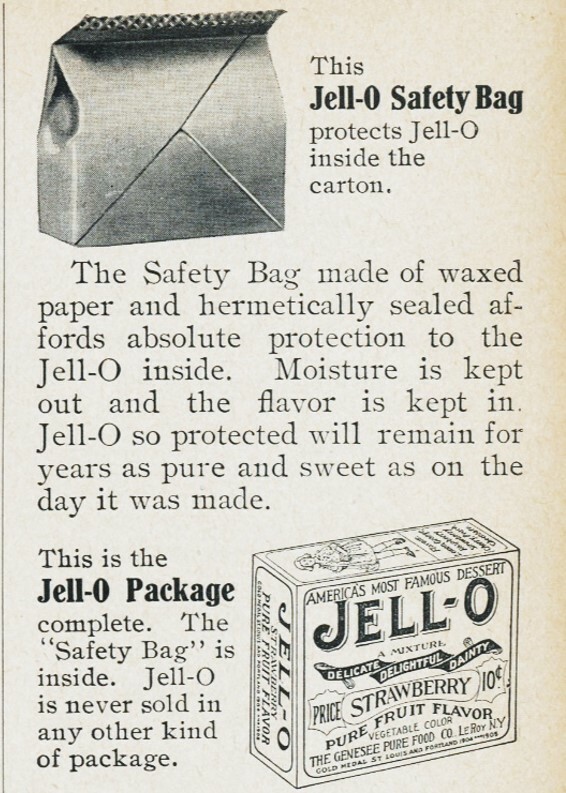 I wish that modern Jell-O would keep for years like the old-time Jell-O in its Safety Bag. Posted on October 27, 2016 October 26, 2016 by SherylPosted in AdvertisementsTagged Advertisements, Jello. That’s really quite interesting. I never have thought of Jell-O having a shelf life. It just was there, or it wasn’t, and I used it, or didn’t. On the other hand, I’ve not bought any for a good long time — not since the last time someone needed a soft diet. It seems like almost all foods have a “best used by date” these days. Sometimes it seems like the date isn’t really needed. You mean you discarded it without checking? I’m a real WWII baby then. I’d have looked, and probably eaten it. And lived! What is Jello, by the way? The major ingredient in Jello is sugar which does not go “bad” and there are artificial flavorings and preservatives so I do not think there is any danger in using it past the “best used by” date. I have used packaged brownie mix past that date and it was just fine. I think that you are right – it probably would have been just fine if I’d used it. I probably was a little over-zealous when I threw it out. Well, since you asked– In 1912, the following flavors were available: Strawberry, Raspberry, Cherry, Lemon, Orange, Peach, Chocolate. Several years ago I posted another old Jell-O ad that listed the available flavors. Quite a selection! Wonder about the chocolate though. Good old Jello! My family was just having a conversation about Jello salads while preparing the Thanksgiving menu. My bucket list includes a visit to the Jello Museum in LeRoy, NY. I think your package probably survived as well as that packaged in the magic pack 100 year ago. You should have made it and seen what happened! I now wish that I’d made it. I’m kind of regretting that I was so quick to toss it. Oh gosh you mean my jello has to go? It does. I used to be famous for my jello molds, but alas they have gone out of fashion. I made a very fancy holiday version of a jello mold which turned out to be very colorful. For the past 5 years I have been asked to make my famous once again jello mold. By the way, let me note that there is never much left over to take home. Fun to bring back the past! Let’s bring back the past often! My dad was two years old when that ad was printed. I guess my husband and I are tough. We have had outdated foods many times without becoming ill. Maybe instead of being tough, we are immune. Current thinking is that people are more prone to illness because of over-cleanliness. Maybe more people should eat slightly out-of-date packaged foods, within reason of course. I tend to agree with you about both immune systems and slightly out-of-date packaging. Oh, this is perfect! I posted about Jell-O yesterday on my writing blog. Going to put a link over there in the comments to this post! One of my friend bloggers from Australia didn’t know what it was and had to Google it. It’s such an American food. Great minds think alike. 🙂 I didn’t realize that Jell-O wasn’t available globally until I did this post. We have Jell-O but we call it Jelly. Jello is the ultimate classic dessert that most everyone loves. The sealed bag had to have been a novel idea, how sweet! I would never have even noticed the expiration date – I thought it lasts forever LOL! I glad you liked this post. I was surprised how long ago food processors were packaging foods like Jell-O in sealed bags. I am sure your Jello would have been fine!! Wonderful ad exactly 100 years ago! I hadn’t thought about it, but you’re right, this ad was from the October issue of the magazine. I’m not able to get my posts all the way down to the month very often. Jello! My grandmother’s favorite “salad”! I play very fast and loose with expiration dates on food–I suspect your Jello would’ve been fine! The advertising on the box caught my attention. “Pure Fruit Flavor” “America’s Favorite Dessert”. They knew the power of suggestion & key words. Not much as changed. Sometimes I very surprised by the foods which have been around for at least a hundred years. I’ve had a throw out a few boxes of Jello for the exact same reason! I wonder if they had an expiration date on them one hundred years ago? I loved Jello as a kid – but over the years I’ve kind of lost interest in it. Even though Jello has been around for more than a hundred years, it seems like it is a long ways from the fresh, natural foods that I tend to prefer. Somehow it seems like there should always be a box of Jello in the cupboard –just in case I need it. I used to be very fussy about best by or use by dates but have tried to relax a little bit about the dates in recent times. I try to use common sense when I make a decision about whether to ignore “best by” dates. My decision-making criteria for whether to keep or toss are a bit vague, but here they are: (1) If it’s just a little past the date, it’s probably okay (though I don’t define exactly what “a little” means; (2) I pay more attentions to the dates for food that spoil easily (meat, fish)–though I’ll definitely taste milk that is a little past the date to see if it tastes okay. The jello around here doesn’t have time to get old, I make finger jello for the grand youngins on warms days ,they love it. I must say I join in with them. 🙂 the boxes were more interesting than today’s box. My sense is that finger Jello is one of the most popular ways to serve it today.